Splash! First capsize this season with Kathleen! What a weekend we have had. This is the windiest I probably have ever sailed in my life. Saturday morning I left the beach in Heist with one of the youths that would sail another Falcon during the Gaastra F18/F16 race held that weekend. It was already quite windy (about 20 knots) but not too gusty. Once on the water I put the boat downwind and handed over the tiller. We sailed about 5 minutes without the spinnaker, so Philip could get used to the boat (he normally sailes a Hobie16 or SL16 and was on the Falcon for the first time). Then we pulled the spinnaker and I got out on the wire. Almost immediately he popped the hull up and we were blasting away! What a guy and what a boat, first time on a high performance boat and sailing it to its potential from the first time. I cannot think of any boat where that is possible! About an hour later I launched again, this time with Kathleen, to head out to the racing area. By the time we arrived at the starting line the wind had gone up to about 25 knots with gusts to 30. We started the first race together with the F18's and were racing with 3 other F16's. In our first upwind leg we had difficulties to keep the boat up to speed. The high waves caused the nose to be blown away each time so I had to correct each time with the tiller. That was slow! As 2 F16's had gone over we still managed to get first to the upwind mark, with a single handler following in second! Also on the first downwind leg we needed some time to get a constant speed. 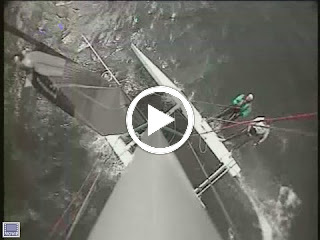 2 gybes later we were ready for the second upwind tack of the race. This time we moved our weight more forward on the boat to keep the nose down and pierce through the waves instead of going over every single one of them. Now we were really getting powered up. Everything was sheeted to the max. We had no more sail, but a wing :-) It was really flat. On the second downwind we were also able to get the speed in the boat sailing the gusts and surfing the waves. By the time we reached the gate we had built a nice lead on the second F16. But unfortunately in the last gybe disaster struck :-), we went over! By the time we had the spinnaker in, the boat up and did a small upwind leg towards the gate as we drifted, the solo F16 had managed to sneak just in front of us to finish. Second place. The youth team made a second capsize and didn't finish that race. By the time they gave the start of the second race the wind reached 35 knots. Sailing upwind now felt more like flying and boats were tipping over everywhere. All of the F16's decided to come in together with most of the F18 fleet. Only 8 boats finished the second race. Great stories were told that evening and great pictures were shown! The second day is short. Wind was blowing again 30 knots. F18 former world champ Coen de Koning decided to go out without his jib! On the first start we were with about 12 boats. Clearly a starboard start but also tricky to do so. We went conservative and did a port start...and got hit by a starboard boat, a Hobie WildCat dug his nose into our hull.... End of racing. Luckily only some cosmetics and no structural damage! We managed to get back safely to the club and enjoyed a nice sunny (but very windy) afternoon on the beach. Well next week we'll be on the water again with a 3day regatta! Stay tuned! Interview with Riley McDonald, 14 year old Falcon skipper! You all know Matt McDonald as the builder of the Falcon, the latest light weight Formula 16 catamaran, based in Florida. But do you know Riley, his daughter? Let us introduce her. Riley is sailing with her dad for almost a year now. She is skippering and doing a very great job! She is young, ambitious, light and the perfect skipper together with her dad as crew on the Falcon. We tought it was about time to have a short Friday afternoon interview with Riley. Can you tell us how old you are right now? How did you get to know sailing? Well, my dad is a great sailor and he taught me everything I know. I love meeting new people and setting new challenges for myself. What do your friends think about that? Oh, they love it and they support me and they are very proud of me. How long have you been sailing the Falcon with your dad? Tell me what you like the most when you are sailing? The rush of it and at the same time the relaxation. You are helming the boat and your dad is crewing. That must be a nice feeling that you can tell your dad what he needs to do? What did you think the first time you got on such a big and fast boat? It was amazing and I didn't want to get off. We heard you got a call by one of the heads of the youth sailing program and you got an invite to train with the youth girls development program? That’s awesome! When would you be starting this training? Hopefully I will be starting this summer, but who knows. I'm really excited though. Any tips or tricks for other young girls who are thinking of starting to sail? Go for it and sail with someone you can trust. Kelly Park River Regatta, May 28 - 29th. You did very well on the last races: finishing first on Saturday and Sunday at Charlotte Harbour: great job! What was the weekend like? Good winds? Decent wind and it was fun, but GYC was more my type of wind. Spring Fever was really fun, light winds and frustrating at times. I need a lot more practice to race in that kind of wind because I really need to pay attention to the wind shifts. What do you like the most: sailing upwind or sailing downwind? Sailing downwind because it feels easier to me. Your mom is also a very good sailor, do you ever sail with her too? Thanks Riley for taking the time to answer these questions! She is the future. Starting young on a high performanca multihull, aiming for the best and still having fun! It is a great story to read! I hope Ann doesn't have to many bruises from all the capsizing!!! :-) This story reminded me of the video they shot in Zandvoort (Global Challenge 2007) with a camera on the mast of their Blade F16. I dug it up and here it is for you to see for the first time or to rediscover viewing this great video before! This year we arrived in Bala in the light – much better than darkness for squeezing the boat over the stone bridge to get to the water and the campsite. It’s pretty tight, only a couple of centimetres gap each side. We arrived to a friendly welcome from Bala Cat Club members and then found Rutland A sailors Dave and Gordon enjoying a lazy evening – so set up camp and joined them. Saturday morning was sunny with a stiff breeze, so we put the boat together and looked forward to the event with anticipation. There were 21 catamarans signed up to take part – great! The first race started promptly at 12. The wind was great for us, and we were third round the upwind mark close behind Gordon on his A, and one of the local crews on an F18. The rest of the lap was a tussle between us and the lead F18. We finally got them on the next upwind. We kept the lead through the second lap, but the wind was building and we saw several boats retire. The third lap was hairy – the wind was stronger and still building. There were capsizes all over the course. We managed to stay the right way up, but didn’t push it. We won the race! An excellent start for us and the F16. Unfortunately, after lunch, the wind was still too strong to sail safely, so racing was postponed, then postponed again, then finally abandoned for the day. We enjoyed a couple of drinks and a meal at the pub. Sunday morning looked more promising, a nice breeze, perhaps a little more gusty than Saturday. Unfortunately, the wind kept building again. By 11 when the racing was due to start, several crews had decided not to go out. Paul and I decided to go out and see. It was certainly gusty! We had an average start, but were doing well upwind. The course was different to Saturday though, and on rounding the mark, it turned out there was not enough water to get the kite up, so a gybing/raising mess ensued and resulted in a capsize! Damn. We were dangerously close to the shore, so getting the boat up and away without damage was a bit fraught. Just as we were getting going, we capsized again through a gybe. Again, far to close to the shore. We’d lost a lot of time, but decided to carry on since boats were going over all the time, and we might make up some ground. We limped down to the downwind mark, rounded and got ready to get back into the groove going upwind. It was impossible. The gusts were crazy, the wind shifts were almost tacking us. It wasn’t fun any more. We decided to call it a day to avoid breaking the boat or us! Only 5 boats finished the race. Racing was abandoned for the rest of the day. We dropped to 5th place. Monday morning we decided to start early, hoping the wind was lighter, and we’d get some races in. The conditions were similar to Sunday, perhaps a little less, but still with fierce gusts coming through. We decided to go out and see. We nearly didn’t start since we had a few failed attempts at bearing away until the gust had passed! We had a terrible start, but kept going. Managed to almost complete the downwind leg of the first lap until a gust hit as we were gybing. Despite being almost dead downwind, we did an almost perfect pitch pole! Both hulls buried, a nose dive – complete turtle! Both unharmed, we set about righting the boat once more. Again we started drifting towards the shore, and had to call the rescue boat for help. He grabbed the spin pole to try to pull us out of danger. It snapped. But we were saved from the rocks. We limped back to shore just as the race was shortened and sailing abandoned again. Only two F18s finished the race! Bacon rolls were most welcome. So, we came 4th out of 21! And were rewarded with a box of chocolates – more for giving it a go I think! First place went to an F18 crew from Glasgow St Helens who had managed to keep their boat the right way up all weekend, and one of only two boats to finish all three races. Despite the lack of sailing, it was a great weekend. Wonderful hospitality, great company and plenty of sunshine. And some great capsize and righting practice! Thanks Bala Cat Club - we’ll be back next year!